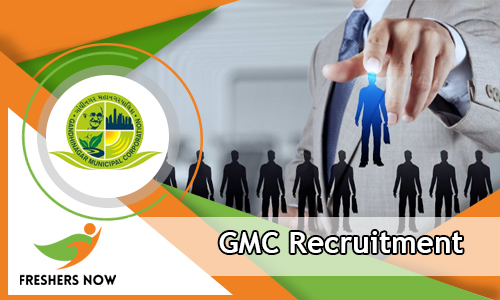 Gandhinagar Municipal Corporation (GMC) released GMC Recruitment 2018-2019 Notification. The Available positions are Health Officer, Sanitation Superintendent, Jr. Town Planner, Zonal Officer, Veterinary Officer, Administrative Officer, Clerk, Sanitary Sub Inspector, Sanitary Inspector, Sr. Clerk, Tex Inspector, Sub Auditor / Sub Accountant, Surveyor / Draftsmen, Planning Assistant, Electrical Data Processing Manager, System Analyst / Sr. Programmer. There are total 126 Vacancies. Therefore, please check them all and apply if you are willing to get placed in any of the Position. And remember that for this purpose, you need to apply at first. Remember that you need have all the qualifications correctly as of the time of applying. Now, coming to the important dates, the officials are going to release the official notification and going to accept the applications for the GMC Recruitment 2018-2019 Notification from 27th March 2018. And the closing date to submit the application is 10th April 2018. 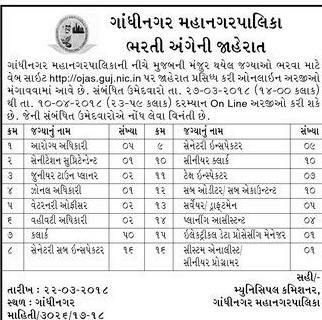 For now, the officials of the GMC issued a Gandhinagar Municipal Corporation Recruitment 2018-2019 Advertisement. Though there is still some time to apply for the GMC Openings 2018-2019, we are giving the information here in this article, so that the people will have an overall idea about the details in beforehand. Therefore, at the time of applying all you have an outline, eventually, you can apply easily. Now, all the contenders must and should have the qualifications at the time of applying. If not the officials are going to reject the applications, therefore, keep this in mind and proceed. At first, all the people should know about the Educational Qualification. Basing on the data that is given in the GMC Recruitment 2018-2019 Notification, all the people should have done their Graduation, Post Graduation from any recognized institute or University in India as the Educational Qualification. Check further for more. So, please check the above table. And it contains all the details that are important and mandatory. In the above table, we have taken enough care to include Name of the Vacant position, Number of Vacancies, Starting Date to apply, Closing date to Apply, Mode of application, the Official website to check the more information. Apart from all these, we are also giving data about the Educational Qualification, Age limit, Age Relaxation, Selection Process, Salary, Application Fee. Also, along with these, we are also providing adequate data related to the Procedure to apply and all. Therefore, all the people who are willing to apply can check them to get an overall idea. Next, to the Educational Qualification, every aspirant must know about the Age Limit that the officials of the Gandhinagar Municipal Corporation have fixed. As per the data that is given in the GMC Recruitment 2018-2019 Notification, all the people need to have the age as per the terms of the organization. But we are anticipating that the officials will give the sufficient information while releasing the total GMC Recruitment 2018-2019 Notification. So, Stay Tuned. And we will update you on this post when the officials announce about other information too. Please remember that while applying for any of the Vacancies, you must have the qualifications correctly, if not all such applications will be rejected without any second thought. Therefore, please consider this fact and try to apply before the closing date. And only if you are having all the Qualifications correctly. Now, next comes the information about the Application fee. Though we are not pretty sure about the Application fee, we are anticipating that the officials might ask the contenders, to pay the Application fee or Registration Fee or the Examination Fee. We can only confirm the information about only when the officials release the advertisement correctly. Therefore, please wait for some time. And meanwhile, you can check remaining details and then decided for yourself, whether you are eligible or not. If the officials asked the people, to pay the fee. Remember that you have to pay it by the closing date. If not the applications will be rejected. Please consider in checking the advertisement or the official site at ojas.gujarat.gov.in before making payment. Next comes the important information that all the aspirants should be well aware. Now, as per the source, that we got, the officials are going to conduct some Recruitment Rounds. Therefore, all those people who will apply before the final date and are eligible have to clear these Selection Rounds. Apparently, all the applicants have to clear the Written Examination. And then Interview. So, only the performance in these rounds is considered. Therefore, all the people have to show the merit. Now, you can go to the interview, only if you clear the Written Examination. Therefore, keep this in mind and proceed to prepare. Do not, worry about our site, you can find all the relevant Preparation materials, without searching much. Now, the officials are going to pay some huge amount. And this will be best in the industry. So hurry up. Now, we all know many people are looking for the Government Jobs. That too in the Gujarat State. This GMC Recruitment 2018-2019 Notification is going to raise hopes for all such people. Please find other important details from the next section. Also, down in this post, we gave some steps to apply for GMC Recruitment 2018-2019. Any Graduation or Post Graduation from any recognized institute or University. Check official site or advertisement. Go to the official site of Gandhinagar Municipal Corporation at ojas.gujarat.gov.in. Look at all the information. So, for more such information as GMC Recruitment 2018-2019 Notification for 126 Clerk, Sanitary Sub Inspector, and other Vacancies, check our site Freshersnow.com.